A magnifying mirror is your worst enemy when you have oily skin and clogged pores. Clogged pores can appear on your face and stay for months. Why are they so hard to get rid of? Many products formulated and marketing to reduce these stuffed up pores contain harsh ingredients that actually aren't very good for your skin. But you can get rid of them using all natural ingredients and products geared towards improving your skin like natural face masks for blackheads! These pores in your skin that have become clogged with natural skin oils and other debris. This can include dead skin cells, sebum, dirt and other impurities. If you have clogged pores, it doesn’t mean you’re not cleaning your face enough. Instead, it means you likely have oily or combination skin, and tend to produce more natural skin oils than those with normal or dry skin. This excess oil backs up in your pores, clogging them up instead of flowing naturally to the surface of your skin. Dead skin cells: In a clogged pore, the excess oil mixes with dead skin cells that have not yet been sloughed off the surface of the skin. Therefore, exfoliating can help. Seasonal changes: Hormonal changes and seasonal changes can affect how much natural oil your skin is producing. During times of high heat (summer) or during your monthly cycle, you can take extra steps to absorb the excess oil from your skin, to reduce oily skin and clogged pores. Improper skin care: Failure to cleanse, tone, and moisturize every day can leave makeup, oil, and residue on your skin that can encourage the formation of clogged pores. Millions of Americans have oily skin and clogged pores, which means that there is no shortage of products out there marketed to help you get rid of them. Unfortunately, some of them can actually make it worse, or may cause damage to your skin. Harsh scrubbing motions: Sometimes clogged pores are too deep in the pore to respond to scrubbing, so you won’t get rid of them this way. Worse, you can irritate the skin, which will only cause it to produce more oil in its defense. Pore strips: These seem like a good idea, but they remove some of the dirt and impurities, leaving the rest of the clogged pore to rise another day. Worse, the ripping motion actually leaves your pores more open and vulnerable to bacteria, which may actually make your pores look bigger. Cleansers with irritating chemicals: Cleansers that contain alcohol, sulfates, and other drying and irritating chemicals may leave your face feeling clean, but will also leave it feeling tight and dry. That means your skin will compensate later by producing more oil—not what you want! Squeezing motions: It’s tempting, as it may dislodge the buildup temporarily, but again, this can backfire on you in the long run. First, your fingers have oils and dirt on them which can contaminate your skin and lead to more clogged pores later. Second, you can damage and irritate the skin by squeezing, and create more visible pores as well as redness and swelling. Heavy moisturizers: It may seem obvious that applying oily products to your skin may increase oily skin or clogged pores, but determining just which oils to avoid can be difficult. After all, some natural oils are actually good for oily and combination skin! As a general rule, avoid “heavy” and petroleum-based oils like mineral oil, lanolin, and cocoa butter, along with products that have chemical moisturizers like isopropyl palmitate and butyl stearate. Inappropriate products: Don't forget to consider your sun protection lotions and makeup. It’s just as important to check the ingredient lists on these products to be sure they don’t contain irritating, drying, and pore-clogging ingredients. Neem: This plant is commonly used in organic skin care because of its many magical qualities. Neem has natural cleansing properties that help with clogged pores. We infuse neem into our Citrus Mint Cleanser, which we recommend for people with oily skin. Rosemary: This herb boasts so many benefits! It is purifying, so we use a pure rosemary distillate to create our Rosemary Toning Mist. Many toners use alcohol and are harsh to the skin. The Rosemary Toning Mist is nice because it keeps the skin soft while helping to prevent clogged pores and balancing natural oils. Grape Seed Oil: Light and high in linoleic acid, grape seed oil helps to control while moisturizing your skin! We use a combination of grape seed oil, fractionated coconut oil (so that it's not pore clogging), and hazelnut oil to create our Herbal Facial Oil for Oily Skin. 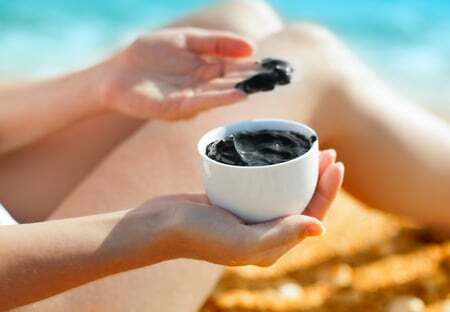 Dead Sea Clay: This mineral rich clay draws out impurities, the impurities that clog your pores. It is the main ingredient in our Dead Sea Scrub, and exfoliator that can be used as a mask or a scrub. Rose clay: Most clays have properties that draw impurities out of your skin. Rose clay is especially useful in skin care products like mud masks because it draws out dirt and impurities without being overly drying to the skin, making it perfect for those with oily and sensitive skin. We use French rose clay in our Purifying Mud Mask. You can get a sample of this mask in our sample kit for oily skin. Keep your hair away from your face: You know those clogged pores that form on your forehead and temples? Those could be caused by the oils and products in your hair. Try keeping your hair away from your face and see if that helps. Also be careful when applying styling products, that they don’t get on your face, as they can also clog pores. Always wash makeup off before bed: Leaving makeup on your face at night means that the oils, dirt, and chemicals in the makeup will likely sink into your pores and cause problems in the future. Wash your pillowcase ever week or more often: Skin oils and bacteria come to rest on your pillow as you sleep. Change it more often to reduce the risk that these elements will be deposited back on your skin. Keep your hands away from your face: The oils, bacteria, and dirt on your fingers and palms are like poison to the skin on your face! Clean your phone daily: Any surface that comes against your face needs to be cleaned—often. Try some makeup-free days: When you don’t have to be anywhere, trying going without makeup to give your skin a break. The fewer the products on your face potentially clogging your pores, the better. Although there are other natural remedies out there for getting rid of clogged pores, including egg masks, lemon juice, and the like, the best approach is to adopt a healthy skin care routine that includes the six steps I mentioned above, and stick to it. When you sense your skin is balanced, step up the application of the masks, and consider using the toning mist more than once a day. Keep all contaminating items away from your face, and you will notice improvement! How do you reduce clogged pores and oily skin? Please share any tips you may have. I have oily skin with a lot of sebaceous filaments (those little grey dots, they’re like blackheads but not? those are sebaceous filaments) all over my cheeks, nose, and forehead. They are the bane of my life. I hate them. I use the Citrus Clear BlackHead Mask now and it keeps them under control and stops them from looking quite so crater-like. It feels nicely cooling at first, and then the pulsing starts. The pulsing is really, really weird. It does actually feel like things are being pulled out from your face, and when it starts to dry it can feel uncomfortably itchy – I rinse it off before it dries completely. The results have been fantastic for me. I do the Citrus Clear Blackhead Mask before I go to bed once a week and my skin looks clearer and brighter and my pores appear tighter the next morning, and any redness is dramatically reduced, plus my sebaceous filaments look smaller, paler, and more even. I’m not sure if I’d recommend it to people with drier skin though, or using it more than twice a week especially if you’re adding apple cider vinegar or other astringents to it. Thank you for all the great tips! !..gonna try these for sure!!! I would avoid this woman’s products as she clearly isn’t aware of the deleterious consequences when applying strongly acidic or alkaline products to your skin. Do not ever use lemon juice or baking soda on your face, as your skin has a sensitive pH balance that shouldn’t be disturbed. For a brief review, 1 is acidic, and 14 is alkaline. Things are either more acidic or more alkaline based on where they sit on the scale (unless it is 7, in which case it is neutral). As a reference point, your skin is roughly a pH of 4.5-5, blood is 7, an effective AHA or BHA is 3.5-4, baking soda is a 9, and lemon juice is around 2.0.
pH is so very important in skin care — too alkaline and the skin barrier is disrupted or damaged, too acidic and you risk burns. Baking soda can be used to scrub stains out of a toilet while lemon juice can be used to break down lime build-up on your tub or sink. These are chemicals. They are not safer than your Cetaphil cleanser just because they are only one or two ingredients. I would like to know where/if this women received her esthetician’s license, as her advice is not only incorrect, but could be harmful to your skin. We appreciate your blog comment. Exfoliating is recommended 1-2x a week, therefore the lemon juice (unless of course someone has incredibly dry/delicate/ and or sensitive skin) is very unlikely to cause burns. Even with a pH of 2, lemon juice is a mild exfoliant — in comparison to even natural chemical peels on the market or performed by a professional, which can be as low as a 0.5-2 pH. Putting an something very acidic or very basic on your face daily could exacerbate certain skin conditions, but using lemon juice and/or any AHA in the right frequency for your skin type is not dangerous or harmful to the skin. As for the baking soda, since it’s only being used as an occasional scrub, it’s very unlikely to change the pH of your skin. We agree there are better options out there. Our facial cleansers are pH balanced. We work closely with two wonderful estheticians to create informative blog articles. Thank you for reading! Forget those cleansers and chemical facial products just wash with water and EVO.